Opened to an enthralled public in December 2014, the Halifax Central Library is an example of an environmentally responsible community building, balancing architectural, social and environmental aspirations. Located on a prominent site in the heart of downtown, the new library stands as a cultural hub and a true civic focus for the entire community. The public spaces surrounding three sides of the library are one of the many welcoming, inviting and completely accessible spaces that have made the library so well received by the citizens of Halifax. Quickly becoming an enduring and instantly recognized Halifax landmark and through the unified success of its physical design and function, the building and the surrounding plazas express, encourage, and facilitate the richness of Halifax’s public, cultural, and intellectual life. The contemporary aesthetic of the building is well complemented by the Series 3000 pavers which serve to strengthen the connection between the interior and exterior spaces. 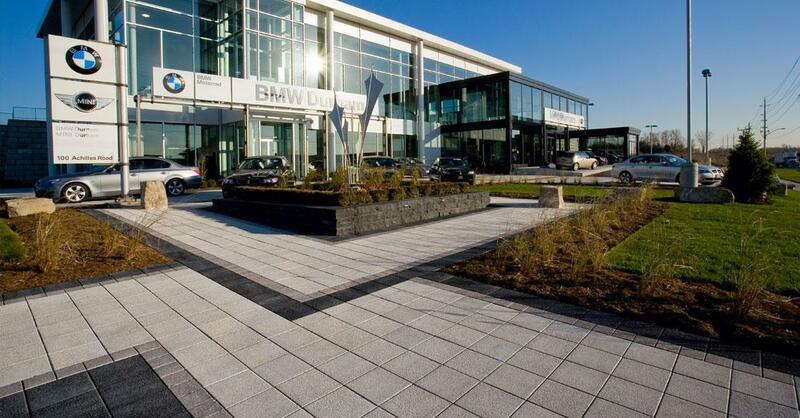 The predominant field paver of Series 3000 300 x 300mm and 300 x 600mm (in both 70mm and 100mm thickness) in Black Granite closely resemble the interior porcelain tiles and the contrasting Series 3000 Ice Grey pavers serve to visually lead visitors to the main entrance doors. These plazas, paved with Unilock’s high quality product, meet the designer’s and community’s goals for both large and small scale public events.